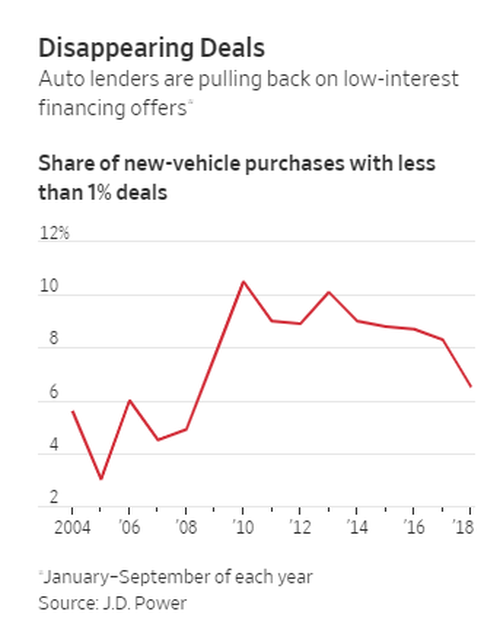 It’s official: prospective automobile buyers aren’t likely to be able to find 0% financing deals anymore. 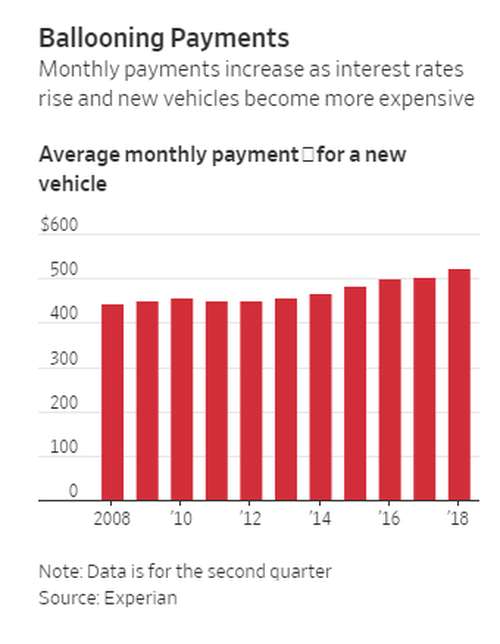 Rising interest rates have caused auto lenders to pull back on the offers that have been the driving force behind the auto industry for the better part of the last decade, the WSJ reports. Until recently, still fueled by big incentives, the industry hadn’t seen too many meaningful aftershocks of rising interest rates. That's about to change in a big way (see "Car Sales Tumble As Automakers Slash Discounts For The First Time In 5 Years"). Lending companies have to pay the difference between the rate they offer customers and the Federal Funds Rate - as a result, 0% rates simply aren't a sensible financial option for captive financing companies, or banks, any longer. While some car companies are switching to different types of incentives, like discounted lease rates and rebates, even those are starting to slow. Speaking to the WSJ, Adam Lee, chairman of Maine dealership chain Lee Auto Malls, said that "for a long time, everything was 0%. At first, buyers could find 0% finance deals on 48-month car loans, and then auto lenders started extending those deals to 60-month loans and eventually 72-month loans. There are fewer and fewer of those deals now." The report noted that in September, the percentage of new cars that were financed with an interest rate of 1% or under was down to 5.3%, down from 8.2% a year prior and 11.7% two years ago. 0% loans made up for 3.4% of new car financings versus 9.1% two years ago. Low rates were a major catalyst in helping the automobile industry run hard for almost an entire decade, all the way back to the financial crisis in 2008. The rise in rates means that the average monthly payment for new vehicles will continue to rise, as it has been, according to data provided by Experian. Despite this, General Motors still offers no interest loans on a couple of select models, like the Chevy Trax and the Chevy Equinox (suggesting that demand for these cars is less than stellar). An executive from General Motors told the Journal that even though these promotions are more expensive to maintain, they’re not going to "drop them from their quiver" altogether. The company is simply going to become more selective on which models qualify for low rates, GM spokesman Jim Cain said. Adam Lee concluded that "The higher payments are making it harder for people to afford a new car. Some are going to used [vehicles], some are holding off [on purchases], and some are going to leases." These rate hikes couldn't come at a worse time: at the start of the month, we reported that automobile sales in the United States for the month of September were nothing short of awful. Results from Ford, Honda, Nissan, Toyota and Fiat all tell the story of an industry grinding to a halt, with few silver linings. Three of these names posted double digit percentage declines in YOY sales and three of them missed analyst estimates. Ford posted an 11% drop, missing analyst estimates of 9.1%. The F-Series pickup line ended a 16-month streak of sales gains. 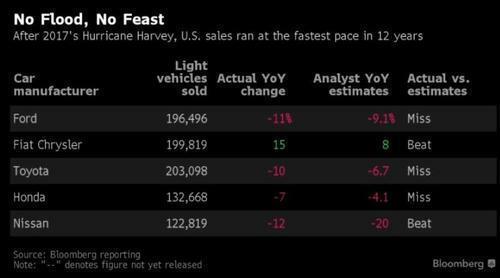 Mustang sales were down 1.3%. Nissan posted a 12.2% drop in September. Nissan and Infiniti brand car sales fell by 36%, including a 28% drop for the Altima sedan as the company prepared to start selling an all-new version this week. Toyota sales were down 10.4%, far below estimates of 6.7% for the month. Combined sales for Toyota and Lexus brand cars fell 25.3%. Fiat posted the only true "beat", as sales rose 15% versus analyst estimates of 8%. However, the Chrysler brand fell 7% to 14,683 vehicles and the Fiat brand fell 46% to 1,185 vehicles. The deficit was made up on Jeep sales, which were up 14%, as well as sales of Ram pickups and minivans. GM third quarter total sales were down 11%. The company stopped reporting monthly numbers earlier this year, with many suspecting that weakness in the production pipeline is responsible; they were right. With incentives and low rates now both fading out fast, the automobile industry could be in for a grim finish to 2018 and an even worse 2019. Perhaps the only question left at that point will be how long it'll take the government to bail it all back out.